Blue Ox Farm is located in Enfield, NH. 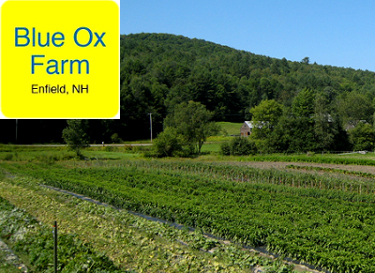 Blue Ox Farm is a small certified organic family farm in Enfield, NH. They grow high quality organic vegetables and annual fruits. Blue Ox started with 2 acres of vegetables in 2002, since then the farm has grown to 15 acres of vegetables in 2013. The farm produces over 30 varieties of crops for co-op food stores, local restaurants, and their CSA. We were lucky enough to score some of their excellent Spring-dug parsnips in the spring of 2013. As our seasonal demand grows we look forward to working with Blue Ox Farm in the future.